The curtains blow out, flap the other side of the sill. Connie Voisine’s third book of poems centers on the border between the United States and Mexico, celebrating the stunning, severe desert landscape found there. This setting marks the occasion as well for Voisine to explore themes of splitting and friction in both human and political contexts. Whose space is this border, she asks, and what voice can possibly tell the story of this place? 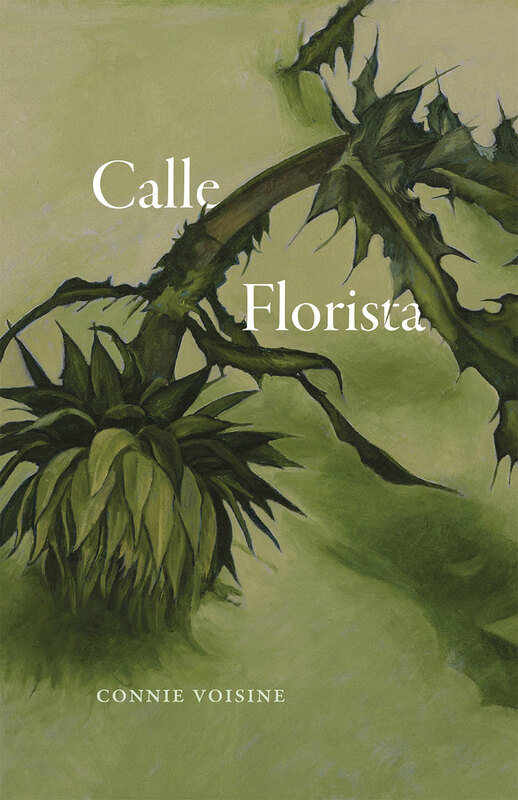 In a wry, elegiac mode, the poems of Calle Florista take us both to the edge of our country and the edge of our faith in art and the world. This is mature work, offering us poems that oscillate between the articulation of complex, private sensibilities and the directness of a poet cracking the private self open—and making it vulnerable to the wider world. Ubi sunt qui ante nos fuerunt? "Aristotle said that the greatest thing by far is to be a master of metaphor, and to be one is to be a genius. Voisine is that great thing, and that genius. Nearly every line of every poem is its own poem. She has re-visioned our most looked-at things. She brings us new ways to see, and to be. To travel through the neighborhood of this collection is to be surprised at every corner turned, but to recognize it completely. There is no greater poetic gift, or thrill." "'The next poem I write will be better,' begins the final poem in Connie Voisine's wonderful Calle Florista. This strikes me as quite a hefty promise, since the poems in this volume are already so gratifying and surprising. They carve a marvelous spot for themselves at the crossroads of joy and regret, pathos and humor, faith and doubt, elegance and quirkiness, making the very most, not only of 'the flimsy scraps that more genuinely / compose the day' but also of the very largest concerns: 'Maybe the soul isn’t a fussy eater-- / still, it is ravenous / and expensive.'" "In her haunting new collection Calle Florista, Voisine dances at the edge of nihilism, an imaginative and moral strategy borrowed from George Herbert, whose style of doubt and recovery she celebrates throughout the book. Her poems flirt with ugliness and with nothingness, negating the body, the street, the desert flowers, the natural world itself. Yet an astonishing, powerful affirmative lyric drive wells up: ‘the way a wren /of a word then another gives itself to a sentence.’ These remarkable poems operate like everyday miracles, driving the reader from despair to belief, word by word—into the perfect radiance of profound poetic revelation."